Studio is a 5GL environment that enables users to develop applications without writing any kind of code. The entire studio runs in the browser. All that you need is just a computer with an Internet connection to launch the studio and work on your application – Anywhere, Anytime. Let's take a brief tour of the Studio. It will not only get you familiarized with the Studio features, but will also show you how the application development process using Studio is simplified by its design. During our exploration of the studio, we will just focus on realizing "What" features are available; the "How" part will be covered in the "OrangeScape Essentials" section. 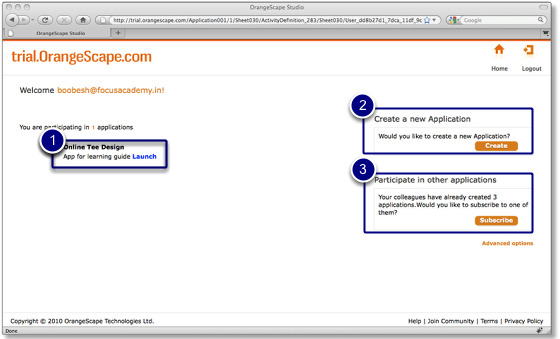 When you log into OrangeScape Trial Studio, home page (similar to the one show below) will be displayed. This page is your portal to create a new application, open an existing application and subscribe to other applications. Create workspace for new application. Subscribe and participate in other applications. This perspective provides an easy-to-use data-modeling environment for creating data models and establishing relationships between data entities to build enterprise class applications. This perspective provides a familiar spreadsheet like interface to define the data and the associated business rules. This perspective provides a visual modeling environment for defining processes and establishing workflows. The sophistication of this modeling environment ensures that the most complex of business processes can be configured with ease. This perspective provides a grid based page builder for designing user interface screens. It also includes a point-and-click selector for defining forms and form elements, specifying permissions and actions, and previewing the user interface screen. This perspective lets you create rich reports and format them based on your requirements. You can also create interactive reports by configuring the reporting parameters. This perspective allows you to test as you develop the application with 'working with data' and 'dependency linkage' driven approach to rule engine! You can test the entire functionality without deploying your application -- test your rules as well as workflows; simulate the run-time environment using the preview feature. This perspective allows you to create custom forms using HTML and design pixel perfect user interfaces. When you open an application by clicking on the "Launch" button in the home page, the design perspective will be displayed. You can click on the "File" tab to open the application workspace page that allows you to publish your application as a template, maintain application properties, tagging different versions of the models, create and access application different versions, define CSS styles and create static lists. Properties: Configure the application and deployment properties such as login authentication, home page and log level. Styles: Define custom styles to be used in forms using the CSS properties. Static Lists: Create a new static list or update existing static lists. Templates: Publish your application as a template for re-usability. We learnt that Studio has been organized into the following perspectives: Design, Rules, Process, Forms, Reports, Actions, Run and HTML Forms. But how do we develop applications using OrangeScape? Is the process any different from the traditional application development? Continue reading to find out!